The 1982 publication of Jaime, Gilbert and Mario Hernandez’s Love and Rockets #1 by Fantagraphics virtually created the model for the post-underground alternative comic book series that characterized art-comics for nearly two decades. In the intervening years, Jaime Hernandez has emerged as one of the most distinctive visual stylists and compelling storytellers in modern comics, as he crafts the still-continuing saga of Hopey, Maggie, and his other post-punk Locas. Publisher and editor Gary Groth asks Jaime about his art and life in this special spotlight session. 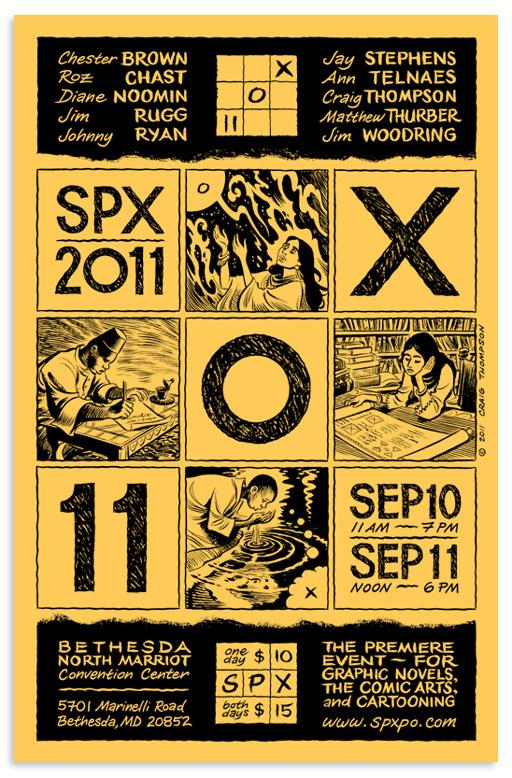 SPX 2010 – Spotlight – Jaime Hernandez from Small Press Expo on Vimeo. Another part to see is the teaching comics section. Comics have increasingly gained a berth as the subject of courses within the academy, and classes about comics production are increasingly a part of studio art departments. What do students need to know about comics? To what extent do studio art students need to know about comics history and theory, and to what extent do humanities students need to know about the practice of comics’ production? Professors Marc Singer and Isaac Cates join Center for Cartoon Studies founder James Sturm for a conversation moderated by Bill Kartalopoulos. 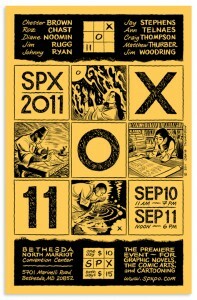 This should be an awesome show, look me up if you want a drink on Friday or Saturday.